African independence launched into international politics a group of the world's poorest, weakest and most artificial states. How have such states managed to survive? To what extent is their survival now threatened? Christopher Clapham shows how an initially supportive international environment has become increasingly threatening to African rulers and the states over which they preside. 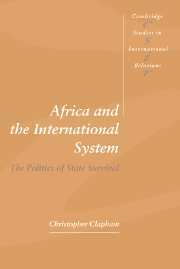 The author reveals how international conventions designed to uphold state sovereignty have often been appropriated and subverted by rulers to enhance their domestic control, and how African states have been undermined by guerrilla insurgencies and the use of international relations to serve essentially private ends. Acknowledgements; List of acronyms and abbreviations; Part I. African States and Global Politics: 1. Fragile states and the international system; 2. The creation of an African international order; 3. Domestic statehood and foreign policy; Part II. Patterns of Alliance: 4. The foreign policies of post-colonialism; 5. The politics of solidarity; 6. The resort to the superpowers; Part III. Struggling with Decay: 7. The international politics of economic failure; 8. The externalisation of political accountability; 9. The international politics of insurgency; 10. The privatisation of diplomacy; 11. Conclusion; Notes; Bibliography; Index.